When you create a new notebook on OneDrive it’s in the cloud. This means you can open it from your computer, mobile phone, or any web-connected device and it will always be up to date. And you can share it with others. In OneNote, click File > New. If you already see OneDrive as an option, skip to step 5. Click Add a Place > OneDrive. Enter your OneDrive or Microsoft Account username (for example, a Hotmail, Live, or Outlook.com email address). Select (Your name)’s OneDrive, give your notebook a name, and then click Create Notebook. If you’ve already created a notebook on your computer, you can move your notebooks to OneDrive. 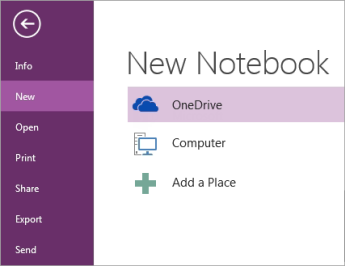 When your notebooks are on OneDrive you can share them with others.